I would certainly stay away from the waters! I've read about the attacks, though I don't remember the location. Terrible anyway. I am with you...ankle deep would be as far as I would go. Weird how many sharks and attacks are being had this summer. Dont remember it ever being this bad. However, hope your enjoyed your time there. I surfed in N CA where they have great whites. That is one I wouldn't trust. Scary when their food supply has been depleted and they search where they have never been. Suppose this is a man made problem by over fishing? Over the years, I was stationed on and off at Camp Lejeune. Top Sail Island is just down the road and I spent a lot of time there. It was very beautiful in the 1970's, not much construction, just a few little beach shops and the odd beach house. I remember picking up sharks teeth there back then. That's very neat! I'm glad you got to go. I guess I'd be afraid of the Sharks, but sharks belong in the ocean, and sometimes there's conflicts between them and people. That is really cool - brings back memories of my Andy finding them! That is a really neat find! Who knew they'd be black? That's so interesting. I live on the mountain's leg and so rare to go to the beach. I have never known that shark's teeth are black like it. As long as I know in our tropical sea, shark is so rare here. Lately...I'd be weary of sharks. There are just too many attacks lately. I'm glad you used caution and did not go in too far. I remember my mom finding a shark's tooth in S.C., but it was white. Are certain shark's teeth black? We were in NC not far from you. I just assume sharks and everything else are around when entering the water, so I try to play the odds--avoid early morning and early evening, and remove all of the beef jerky wrappers from my pockets before diving in. We had the kids in just below their wastes. I was ordered to stand out deeper and keep watch (call me expendable) --oddly there were lots of "skates" in the waves which I have never seen there before. Hmm, yeah, sharks are not a fave. I do think they're fascinating/cool though. The teeth are a great find. I've never ever seen shark's teeth before (and there are sharks where I used to live in Kota Kinabalu) - just never washed up on the beach like that. I don't have a fear of sharks (am afraid of spiders instead) and have swum with them before (once in KK and once in Australia) - they're quite docile in general, even in the wild they're not likely to attack people unprovoked. I was just in SCUBA gear and nothing else (no shark cage) but these are not great whites or the more aggressive ones though. I'm not bothered by them at all never having been in the ocean! 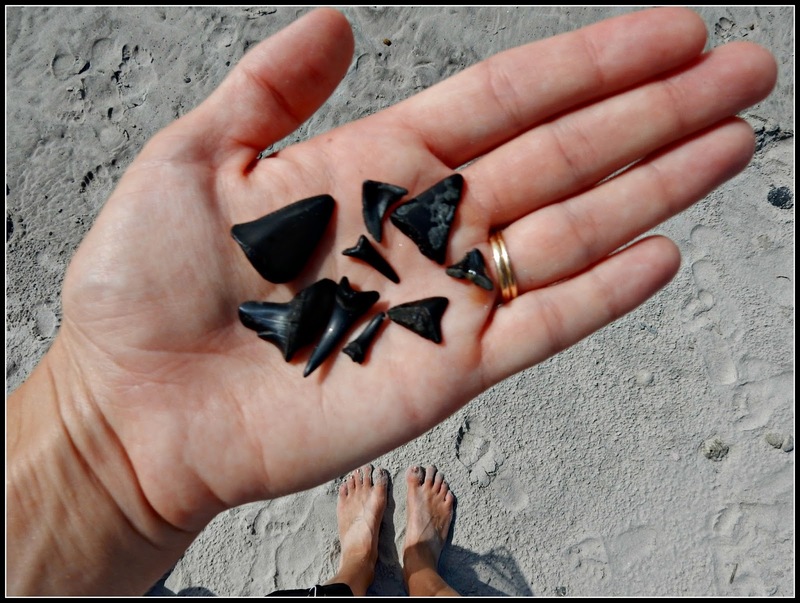 I've always wanted to find shark teeth on the beach and never have. I ran into someone that had jars of them once. When I was a child, we lived in Panama on the air force base. My parents took us kids swimming often and I will never forget the shark nets that were out a certain distance in the water to protect the swimmers. I never saw a shark, but I always feared them when swimming. Since then, I have only gone swimming in the gulf during a trip to Florida ..not sure I would be brave enough to go where I knew sharks were attacking. What fun to find all those teeth. I'm glad y'all had a good time. The shark sightings have been scary lately. I would be like you and only get in the water ankle deep. The shark teeth are a cool find! Happy weekend! It looks like a lot of sharks teeth to me. I visited Topsail Island many years ago. It was a nice, quiet beach, and I enjoyed it. Sharks? I think they're beautiful creatures, but I wouldn't want to chance coming in contact with one! I've watched specials on cable TV about marine biologists tagging certain species of sharks. I regard them with the same trepidation I have about snakes! Wow. I can't believe you found real shark teeth on the beach! I'm glad you played it safe. I am not a fan or sharks or swimming in the ocean. I LOVE the ocean (from the beach), but after getting stung by jelly fish and having some other close "encounters," I enjoy admiring the ocean by taking long walks or maybe by parasailing, but that's about it! Sharks are fascinating (as long as they're behind a glass wall)!